Three to four (3-4) pound cross section of our most popular gems. 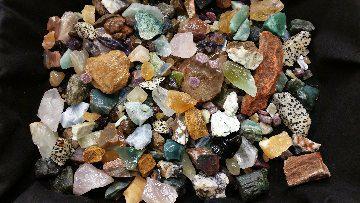 A nice mix of Amethyst, Citrine, Aventurine, Topaz, Moonstone, Ruby, Sapphire, Emerald, Quartz, Aquamarine, Tourmaline, Agates, Jaspers, Calcites, Flourite and others. Stones vary from specimen, tumbling, cabbing even some facet quality.